Crossley’s portrait as a Che Guevara Jesus crucified? This post is an overview of chapter 4 of Jesus in an Age of Neoliberalism by James Crossley and is part of the series reviewing this book. What troubles Crossley is that the traditional focus of historical Jesus studies has concentrated on the qualities and actions of the person of Jesus in order to explain the formation of Christianity and tended to either overlook or minimize the role of larger historical forces (sociological, economic, political) in Christianity’s emergence. Most historical Jesus studies attempt to identify sayings and doings of Jesus the individual. They assume he personally is the decisive factor, effectively independent of other historical forces or trends, that produced the Christian religion. Crossley links this approach to what he calls “individualism” or “individualistic history”, both in this context said to mean that the historian writes as if the individual acts all powerfully and autonomously in apparent disregard for larger forces in the material world. So far I can sympathize with Crossley’s concern. This contrast between historical Jesus studies and the sorts of historical studies in other fields (including historical biographies) was the first thing that struck me when I began to read works about the historical Jesus. To anyone who is even slightly familiar with other historical biographies it is very clear that the study of Jesus is in a class of its own. But Crossley goes further and directly associates such an “individualism” with capitalist values. Again I have to confess I find Crossley’s message unclear. Scholarly reconstructions are not said to be making Jesus himself to be a capitalist. Crossley’s target appears to be the politics of his peers even if these political views are not clearly linked with the particular types of Jesus they produce in their scholarship. But Crossley for most part in this chapter tackles the historiographical question itself. He faults scholars for failing to address the larger historical questions of why Christianity emerged at the time and place it did. John Dominic Crossan, Crossley explains, did indeed attempt to do this to some extent, but at the same time he failed to the extent that his references to background sociological and economic forces were really used to explain what sort of person Jesus was. Moreover, readers of Crossan’s work likewise focused on Crossan’s view of Jesus as a Cynic-like peasant sage and tended to lose sight of the broader historical forces. Thus for Crossley the fault lays not only with the authors but also the readers of the works on the historical Jesus. Crossley is quite right in that historical Jesus studies do not produce the sort of historical biographies we find in other historical inquiries. Unfortunately he fails to grasp what I consider to be the real reasons for this quirk. Jesus studies are primarily attempts to discover what qualities Jesus had, what he did, what he said. They do not work with a set of givens and demonstrate the ways that “great man” changed events and influenced people. Such ideas are very often found in the afterthoughts or prologues where the author expresses some devotional sentiment. The studies begin with the assumption that he did influence people and attempt to find out what it was that he said or did that had such an impact. What I am getting at here is that there is no secure bedrock historical data that unambiguously testifies to the type of person Jesus was or the things he said did. Those historical biographies that dive in on the assumption that the gospels can be trusted as historical evidence are not going to be accepted among critical scholars. Increasingly now we see a number of critical scholars falling back to the “general impressions” of Jesus in the gospels as their bedrock data. Of course these general impressions — e.g. that Jesus appealed to the poor because of his attacks on the rich (this is Crossley’s own impression of Jesus that he takes as a historical given) — are really theological products. It is theology and literary mimesis that can be demonstrated as the core inspiration and source of the gospel narratives. A good number of scholars continue to sidestep the studies that clearly demonstrate the literary origin of the baptism, the miracles, the teachings of Jesus; they continue to work on the assumption that the canonical gospels are by and large the products of oral tradition and memories of the historical figure. Given the long-held understanding that the gospels are indeed theological tracts scholars have sought to find ways and means to uncover the historical person beneath them. This indirect and inconclusive method is what makes historical Jesus studies unique. There are no clear criteria or methods that can reliably discover a real historical person that all scholars can agree upon. This is quite unlike studies of other historical persons for whom we do have qualitatively different sorts of evidence. I won’t delve into all the details of this now since it’s a topic I have covered repeatedly in the blog and elsewhere. My point is that Crossley fails to grasp why scholars have never been able to get beyond struggling to find what sort of person Jesus was and what sorts of things he did. The evidence is hidden beneath theological claims and there are no controls to guide historians or theologians to peel away theological layers in a way that will guarantee unambiguous historical data beneath. And until we know what Jesus really did and what sort of person he was it remains impossible for us to know how he interacted with, or how he was shaped by, the broader historical (economic and cultural and political and sociological) trends of his day. In historical biographies of Alexander the Great or Julius Caesar historians have clear evidence of what the persons did and the larger forces of social and political developments with which they operated. There are controls by which we can test much of this evidence. The reason historical Jesus studies are so different is not only because of the theological importance of Jesus the person but because all the undisputed evidence that we have from sources that qualify as possibly being informed by eyewitnesses or by people who knew eyewitnesses is theological. Every deed and saying in the gospels serves a theological function. Even Jesus’ death has significance solely because of its theological meaning. When Jesus’ family rejects him we are reading another patently theological datum: the prophet (like Joseph, David, Moses, and all the others) must be rejected by their own to affirm their validation by God. Crossley’s claim that a “great man” view of Jesus (as opposed to a study that finds Jesus to be a product and agent of larger historical forces) is debatable from another angle, too. Jesus does not teach “individualism” as a prized value. Quite the contrary. Jesus is presented as acting as a slave of God who calls others to become slaves who show the same kind of love and obedience that slaves were expected to have for their masters. Followers must lose their individualism, their lives, to follow him. In sum, yes, Crossley is correct in noting that studies of the historical Jesus do tend to dwell upon the individual at the expense of addressing wider forces that might explain why Christianity happened where and when it did. I believe he misses the key reasons for this failing of his peers, however. It is not only that Jesus is of theological importance, but the nature of the evidence for a historical Jesus is virtually non-existent. At least it is hidden, we must assume, behind theological narratives and sayings and ecclesiastical epistles that tell us precious little about a historical Jesus. And yes, most of Crossley’s peers are Christians or “lapsed Christians” (as Crossley himself reminds us) and we might therefore expect their political views to reflect the conservatism of the Christianity to which they belong. Crossley has not at this point suggested that these political views actually shape the character of the Jesus they produce in their scholarly studies. Posted on 2014-05-05 11:58:28 GMT+0000 by Neil Godfrey. 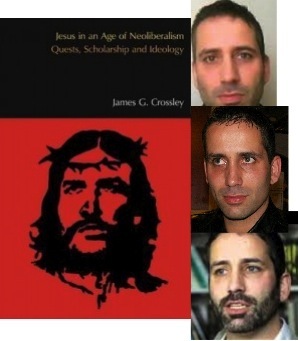 This entry was posted in Uncategorized and tagged Crossley: Jesus Age Neoliberalism, James Crossley. Bookmark the permalink. Could it be, Neil, that the issue is reification? I haven’t read Crossley, but it is obvious to me also that there are virtually no historical materials on Jesus, and that “historical Jesus” scholarship assumes the result and rationalizes based on that assumption. Thus, we have JD Crossan’s voluminous discussion of methodology in his books, and it is like reading some adolescent’s game of sophistical reasoning, with “criteria of dissimilarity” (does Crossan use that one?) and “multiple attestation theory” and “indirect rationalism” (I know he uses those) etc. – a grab bag of methods that would never be used by historians to test the validity of a truth claim, because such methods would not be needed. Modern historians, at least, would begin by distinguishing a myth from a historical document before beginning the assessment of accuracy. The rationalizations are a form of reification of a desideratum. Some type of “real” Jesus is necessary. The question then becomes, Why is Jesus necessary? From the historiographical standpoint, we have a similar question, Why is the Great Man theory important, necessary, viable? It is no longer the preferred theory, of course, but it was for a long time. So we might ask the question, Is there a common reason why both Jesus and the Great Man theory are necessary? What do they have in common? I don’t have an immediate answer for this, but I know what someone like Riane Eisler would say. However, what you have is a book that ties the reason to capitalism. You see a flaw here, and I can’t question your reasoning, because I haven’t read the book. But I’m interested in reading the book, because it is a strange fact that Christian fundamentalists and their favored politicians seem to associate their religion with free market capitalism. Why do they do that? Jesus says give all you have to the poor and follow me. The Book of Acts has Peter striking Ananias dead for failing to follow the rules of the Christian commune (communism). I suppose one answer is that as a religion becomes widely accepted, its iconic figures become little more than talismans representing the ideologies of the status quo, but how does this process occur? One reason must be that historians get hold of the icon and treat it according to their preferred matrices. So Jesus rescues the adulteress and urges no one to cast the first stone, and then we end up burning witches in the name of Christ. I guess what I am getting at is that I would not be too quick to dismiss preferred political doctrines as a motivation or an explanation for quasi-historical reifications, whether they are conscious or unconscious. Every other preferred ideology gets drawn in (a male-identified God, e.g. ), so why not capitalism? Thanks for the most interesting thoughts on this. My post was originally drafted much longer than it finally appeared; there is so much more to say — and you have brought in new perspectives on the discussion. Certainly many American believers tend to picture Jesus as a good capitalist but I was at a loss at the time of writing to think of scholarly works that produce this result. The focus is far more on the “Jewishness” of Jesus nowadays, and there’s a long story there. To be slightly unkind I do have to confess that I find the book so terribly tedious the more I attempt to distil its contents for reviewing. It is very difficult to get a clean handle on what Crossley’s point is as he takes on so many diverse views and scholars with what so often reads too much like an almost juvenile rationalization (as you see in aspects of Crossan’s work — but you always know where Crossan is leading the reader!) to manufacture faults and a case to make a debating point. Scholars don’t deal with larger historical forces; Crossan does? okay, but only to highlight his Jesus and besides he uses “all sorts of weird and wonderful sources” to argue his point; which is what the point of historical biography is, is it not? okay, but those who receive Crossan’s work ignore the wider history and focus on the individual; and besides, their personal political views are naive and wrong so how could their Jesus be any better? . . . that’s how it seems to go page after page. I am sorry I started this series. I sense that Crossley has taken sides with Maurice Casey as a self-described “independent scholar” and has only produced work that truly is eccentric and riddled with logical and methodological fallacies in his efforts to take on his Christian counterparts. Please do drop it then. I’m sure your drafts folder has excellent subject matter to discuss. Or, if you choose not to drop it, I’ll at least say eugh! You read it so we don’t have to. The common schoolboy notion that Great Men alone make history happen, has some famous disadvantages. As has been wellknown since the “Annales” school of history, it is better to look at the variety of forces at work in all of culture. By the way too? The simplistic focus just on great men, as if they alone and by themselves are responsible for all innovations in history, is biased against seeing any individual as part of – even the creation of – a greater culture. With its myths and so forth. The Great Man theory is not only simplistic. It also biases historiography against Mythicism. Our author is therefore at least partially right: we all need to look at the broader social context, including ancient economic systems, to understand “Jesus.” We need to see the larger cultural forces that molded his character. Then, since those forces are often in the hands of everyday people, finally everyday humble people assume more importance than kings and lords. The last are first. I was originally attracted to Crossley’s works because I liked his politics (to a large extent, not completely) and he seemed to be saying the very things I had myself been thinking with respect to historical method and the nature of historiography. I really had hoped to find a pioneer or counterpart in New Testament studies to the minimalists of the Old Testament. Instead, I found a scholar who seems to be lost so often as a result of his unquestioned assumptions in the model of historicity and the familiar rationalization of the conventional Lukan-Eusebian outline of Christian origins. Actually, your own blog Vridar is probably the best clearing house for more advanced Mythicist theories. Ideas well in advance of most of Crossley. Though his work has some usefulness. Is it still possible to access Vridar 1? What was the outcome of the shut-down attempt? I challenged Joel Watts’ take-down request through the formal legal procedures as advised through WordPress.com and since my challenge went unanswered by Joel Watts WordPress.com reinstated my blog. The blog was transferred in full to this new site. We are now, hopefully, less susceptible to the whims and misjudgements of disgruntled readers and naive site-owners. I did hear that Joel Watts was continuing to mutter to anyone interested that I had breached his copyright (a lie as we demonstrated since his post was clearly marked as ‘creative commons’ and I clearly indicated his own authorship — which was the problem: I had exposed him as an ignorant, incompetent fool) but he failed to defend his initial complaint when I responded with the evidence that he had even clumsily attempted to change date-stamp records in his computer. The last time I “met” Joel Watts online was when he appeared on the new Biblical Criticism and History Forum preparing to argue his case for his book Mimetic Criticism and the Gospel of Mark. http://earlywritings.com/forum/viewtopic.php?f=3&t=426&hilit=Joel+Watts#p7307 I did ask him a few questions related to his book but he just disappeared after that. What this sorry series of events shows is the deplorable culture that appears to pervade biblical scholarship. For Watts to be awarded accolades or any kind of support for his illiterate and incompetent efforts to make any contribution to biblical studies only serves to demonstrate what a cozy club of mutual back-slappers there exists amongst the scholars. It is a sham – and a blight on those who really do make serious and worthy contributions.